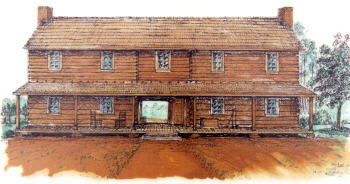 New Echota is one of the most significant Cherokee historical sites in the nation. 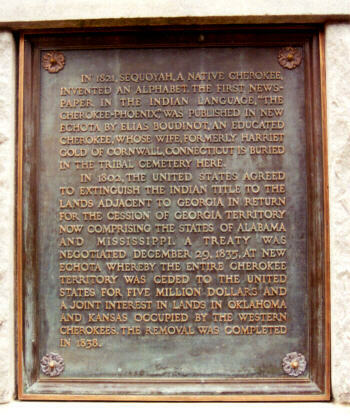 The fate of the Cherokee people and our homeland hinged on the validity of the Treaty of New Echota, signed by candlelight on the night of December 29, 1835 by a handful of Cherokee leaders, none of whom had the elected authority to do so. Perhaps the absence, or dismissal, of the treaty would have changed nothing. We will never know. As we explore New Echota, you will hear the story of what did happen. Maybe we can learn both about and from it. Like the symbol of the Phoenix rising up, all of us benefit. We can acknowledge the truth, the mistakes, the injustices . . . . . . . then we can forgive. 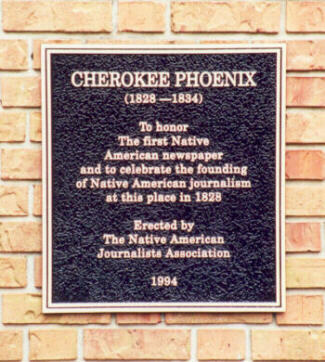 Though my Cherokee connection is seven generations past (I have been known to joke if I sneezed too hard I could lose it altogether), I am writing this in a first person possessive style, for this has become my story over these last thirteen years, since I was called to this path as a part of my spiritual journey. 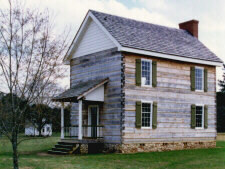 I visited New Echota for the first time on March 27, 1998 (picture rolls 426 thru 429) with my son, Christopher, while we were visiting relatives in the south. I returned on February 18, 2000 (picture rolls 550 thru 555) with my wife, Donna. I returned once more, alone, January 12, 2005 with my digital camera (D752 files) to find they had significantly changed the museum display area. You will see a mix of images from all three trips. Although these will be the most extensive scrapbook photos pages I have done to date, nothing compares with walking the ground where it all took place. 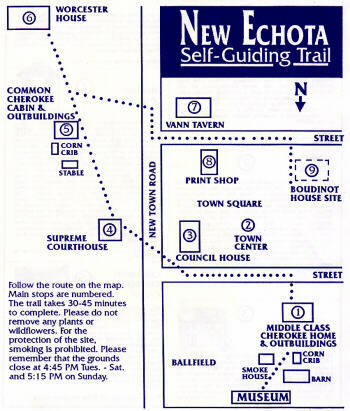 If you can, definitely visit New Echota, particularly if you have any Cherokee heritage at all. For the rest of you, my tour may need to suffice. Come, we will use the Self-Guiding Trail map provided. 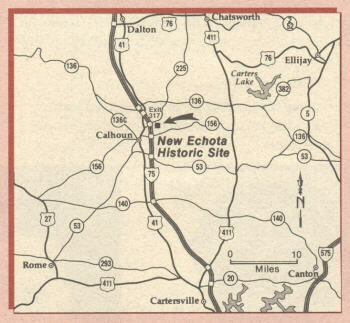 New Echota is located north of Atlanta, Georgia, just off I-75. It is not too far from the Chief Vann House (one of my first scrapbook photos pages). Before we enter the museum we will look at some of the signage by the entrance to the site and the museum. If this were a continuation of the SGT map (above right), the highway we came in on would be about where the first line of this text is. After driving past the entrance sign (opening photo) we notice an historical marker pointing across to the other side of the highway. Further down there will be more information about the former McCoy and Hicks sites which are on private property and not a part of the New Echota public access area. This might be a good place to mention, each of the photos, starting at the museum entrance, will be a link to another side page. This would be way too long and photo intensive, if I put everything in this one spot. It would take dial-up or slower computers forever to open. The additional pages will be topical and correspond to each stop we make. 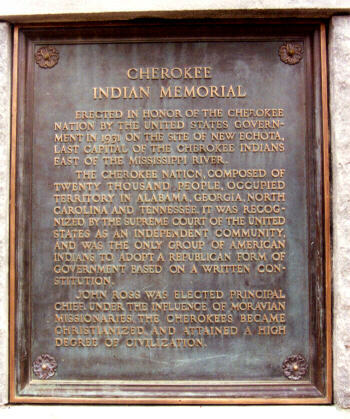 As we approach the museum entrance, there are other signs and plaques which give us some overview of this place and Cherokee history. The inset in the monument photo at left is from 2000. The main photo was taken in 2005. Did you notice the difference in the flags? I had not until I was working on these pages. The Confederate Bars & Stars were still flying in 1998 and 2000. 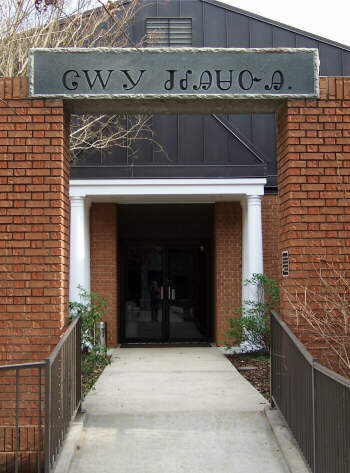 Before we get into the museum, do you remember the New Echota Ferry sign above pointing across the road? Well, here are some sketches and information about the former McCoy and Hicks properties (photos of sketches actually, as will be all such drawings and other graphics throughout these pages). I cannot remember, but the sequence of photo numbers would seem to indicate these pictures were from an information standard outside, rather than inside the museum. 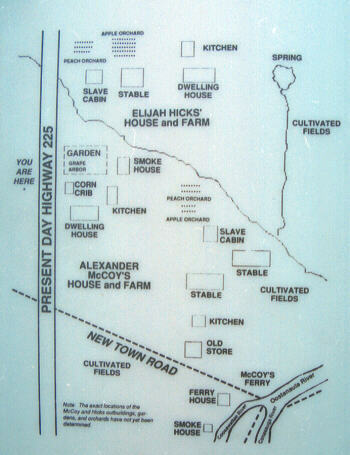 Alexander McCoy House (above upper right). "Alexander McCoy, his wife Sarah, and their eight children lived in a large two-story 'dogtrot' style log house that once stood just across the highway to your right. 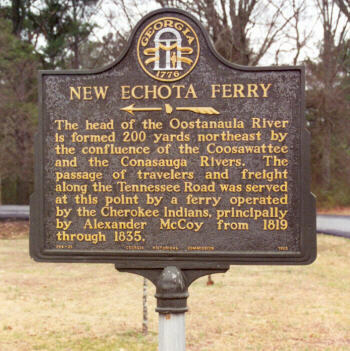 McCoy was active in the Cherokee government and was also a successful businessman who operated the New Echota ferry." McCoy‘s Stables (above center right). 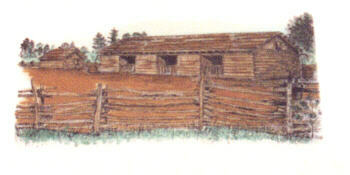 "An unusual set of stables sixty feet long stood near the McCoy house. McCoy rented rooms to travelers in his home and needed the large stables for their horses." 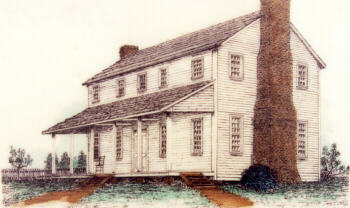 Elijah Hicks House (above lower right). "Elijah Hicks, his wife Margaret, and their seven children lived in a large two-story frame house which was located about 300 yards NW of here. 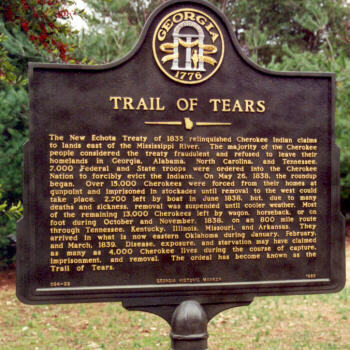 Hicks was active in the Cherokee government, served as editor of the CHEROKEE PHOENIX from 1832 - 1834, and led one of the detachments on the Trail of Tears." We will see more homes, along the way. One of the things I would like you to remember as we go along, is that this is the early 1800's. These dwellings were already the homes of the Cherokee, the way we were living, before the soldiers showed up to remove the "uncivilized Indians" to the west. OK, let's head into the museum (click on the photo to open the museum page). It is also where you pay the entry fee for the grounds. 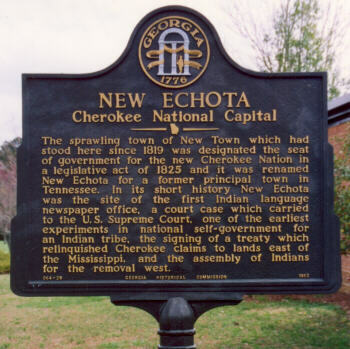 In addition to the SGT brochure/map, we have been given a brochure entitled "New Echota State Historic Site: Cherokee National Capital, 1825 - 1838." If you would like to read some of the text before taking a look at the museum, click on "brochure text" below. Additional links to the text will appear throughout these scrapbook photos pages wherever the topic relates. On my visits , I varied whether I visited the museum or the grounds first. By the way, as mentioned on the Great Lakes Folk Festival last page, this is one of those self-portrait photos. Just so you know I was actually there. Well, maybe the best angle for the photo had something to do with it too. There are nine stops laid out and described in the SGT brochure/map. Starting in the museum you can exit to each of the nine locations in sequence, or use the picture links below to each page. "It is a very worldly and short-sighted belief that winning automatically erases the consequences of any injustices which occurred in the process of reaching victory." Injustice anywhere, in any form, contributes to the darkness of our world. The negative energies from this incredible injustice persist yet. They haunt this land we call the U.S.A. I can feel them lingering inside and around me when working on something like composing these pages. And, although I have written these pages using a first person possessive style, if you are an American, this is as much your history as it is mine. I do not have the answers for the above quote. Repent and forgive are nice sounding words, but we cannot say "we're sorry," then go on mistreating whoever the next group of human beings is which stand in the way of our selfish desires, or personal prejudices. After doing all we asked of them (acculturation and civilized society), and in a time of peace (there was no Cherokee version of a Geronimo or Sitting Bull staging or calling for uprisings, or on the warpath), we required my people to leave their homes and make an 800 mile journey west; cold, hungry, and disheartened, lasting an average of 116 days where many of them died. All because in our greed and prejudice, we still wanted their land and gold. Let me ask you this, were you willing to take the time to walk this entire "trail of tears" with me through these pages? Or, did you skip around or skim over it, because your life is too busy for something as unimportant (or boring) as old history. History you do not necessarily even see as your own, though it is. If so, shame on you. Such an attitude places you among those destined to repeat the tragedies of the past. I do not get paid to do this. Plus, I am not enough Cherokee to derive benefits from casinos or anything else "whites" tend to bring up when speaking about such things. The museum page alone took me in the neighborhood of 40 hours to create (many late nights). This "self-guiding trail" is my way of saying, from this day forward, let the path of greed, prejudice, and injustice not be the American way. Ordinary people let and made it happen. This is our time to make the choices. If you never look at any other of my Scrapbook Photos pages, I hope you will come back to this one as often as you need to as a way of bringing back perspective. A Cherokee leader was supposed to look seven generations back, and seven forward, when making important decisions. I claim no such title, but stand at a seventh generation distance and ask you, though we must forgive, never to forget.